Quantum Equipment Co. Pvt. Ltd., always front runner in XRF Gold alloy analyzer and laser marker in Asian and Gulf countries introduces its new series Karat Meter JL based on high end PIN diode and silicon drift SDD detectors. Thanks to our European partner who has developed such a great technology on OEM basis in compact design at reasonable cost. Karat Meter JL is the only instrument available with low power X-ray tube achieving count rate as like high power tube due to its patented geometry and micro-collimator. The special filter mechanism allows to detect all required metals within jewelry and precious alloys accurately in few seconds. All high power bulky X-ray tubes are outdated which are expensive, limited life span and difficult to handle. One can give the example of old high power bulb or tube which are replaced by low power LED now-a-days giving better efficiency, performance at affordable price. The running expenses are also very less without need to any maintenance. Most of corporate and chain jewelers, hallmarking and assaying centers are preferred to use high resolution detector based XRF precious alloy analyzer which can able to determine all metals including banned and restricted elements. Due to high resolution the unit works excellent under standard less Fundamental Parameter (FP) calibration. FP is usually calibrated only with pure elements and coefficients are corrected with few known standards. The presence of any elements (Ir, Ru, Ga, Os etc.) is easy to detect with expected accuracy and simple to use where one can add or delete any element of interest even in future. The life of such solid-state detectors is not depends upon time-span or usage hence does not affect on performance as resolution remains reasonably constant without need for re-calibration. 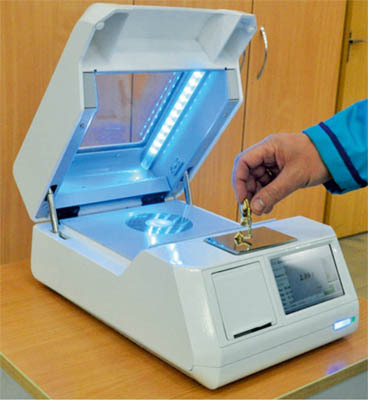 The unit is able to distinguish between 99.5% and 99.9% Gold based on the traces of Ag and other impurities. This is possible only with solid-state detector due to excellent resolution and high count rate. Single calibration mode can be used for all precious alloys including yellow or white Gold, silver, platinum, palladium etc. where any unskilled operator can use the system. Built in touch-screen and computer makes the unit plug-and-play which can moved to any place without need to special installation procedures. Several unique options like weighing balance interface for direct calculation of pricing based on weight and purity, ticket printer for reports, collimator changer for different sizes, battery pack for field operations etc. are available as and when required. QUANTUM is always ahead in XRF and Laser technology since last several years and majority existing as well as upcoming hallmarking centers, major jewelers, assayers, traders etc. are using our Karat Meter since long. We also provide right consultation and assistance to establish the assay laboratory/hallmarking centre and to train their people for right applications. Anyone interested in such projects can contact us on Tel: 022-25005011/12 or write to Email: quantum@karatmeter.com. You are most welcome to visit our website www.karatmeter.com for further product information.